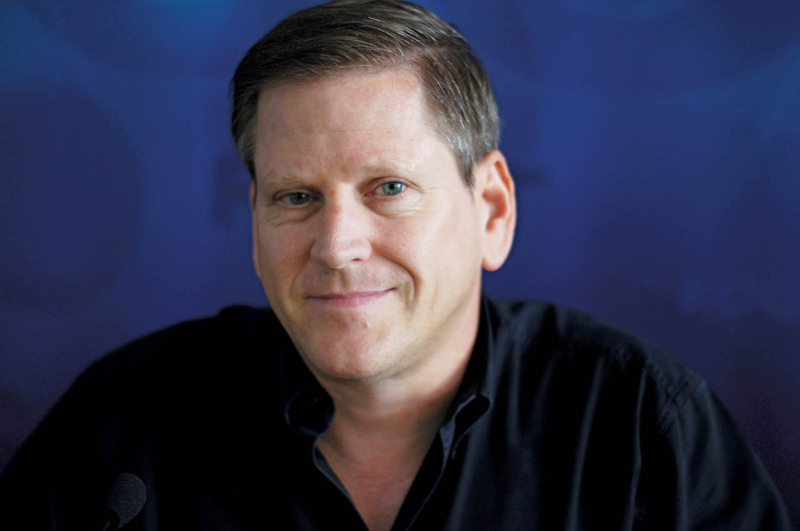 Philip S. Robertson, Jr. ’87 is a forward-looking man, not given to excessive reflection on the past. Given the nearly limitless capacity of humans to infringe, often quite brutally, upon the fundamental rights of their fellow humans, it’s easy to understand that Robertson’s work as the deputy director of the Asia Division of Human Rights Watch demands most of his time. But when he finds a few fleeting minutes to reflect on all that he has accomplished in the 26 years since he graduated from Trinity, Robertson realizes that it was a book, Jonathan Schell’s The Fate of the Earth, that set him on the trajectory that would carry him from Frog Hollow to Bangkok. Schell’s prize-winning book, published in 1982, grew out of a series of articles he wrote for The New Yorker about the nuclear arms race. The vision it depicted, of the earth plunged into endless winter following a nuclear holocaust, was profoundly disturbing to the young Robertson. The son of a businessman who is a conservative Republican and a school athletics coach who is an avid environmentalist, the Bridgewater, Massachusetts, native says he grew up in a home where the values of fair play and anti-discrimination were instilled early. Yet, before he read Schell’s book as a high school senior, he had no conception of how those values might serve as the framework for a career. That motivation found plenty of opportunities for expression at Trinity. A history major, Robertson arrived at the College as history was unfolding. A strong bloc of conservative groups on campus was seeking to muffle environmental organizations, he recalls, and he quickly found a way to play a role in the conflict of philosophies as a member of the Connecticut Public Interest Research Group (ConnPIRG). The relatively new organization used information to counter the influence of large corporations and special interests threatening consumer health and safety. By 1986, Robertson’s passionate engagement in the work of ConnPIRG and his public relations experience with the Americans for Democratic Action earned him a position on ConnPIRG’s state committee. “That really propelled me into making the world a better place,” he says. “It also gave me a lot of experience interacting with the state legislature.” When he wasn’t volunteering his time with ConnPIRG, he was immersed in a curriculum of his own design, heavy on comparative religion, Eastern philosophy, and the history of colonialism. 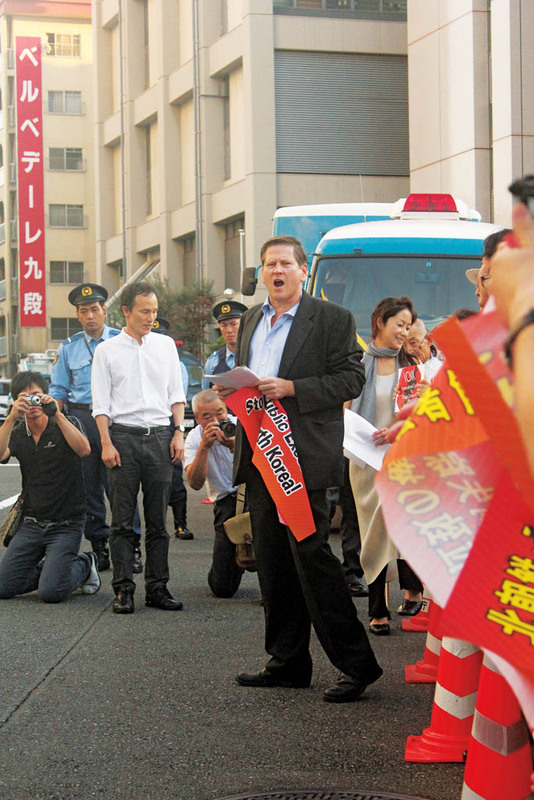 Phil Robertson ’87, deputy director of the Asia Division of Human Rights Watch, leads a protest in Tokyo, Japan, in September 2011 in front of the Chosun Soren, the pro-North Korea “society” that acts as the de facto embassy of North Korea in Japan. And it served as a kind of public policy boot camp after which, in 1990, Robertson jumped on an opportunity to really engage in human rights work in the region about which he’d been writing. 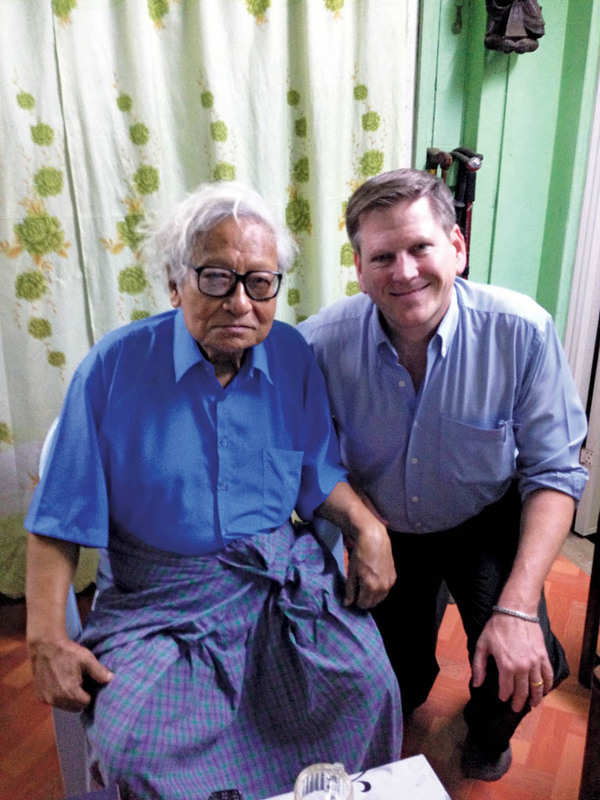 As an assistant field team leader–later promoted to field team leader–he spent two years with the International Rescue Committee/Joint Voluntary Agency, managing a 20-person multiethnic team assisting Hmong refugees from Laos on the Thai-Lao border. It was the beginning of a lifelong love affair with Thailand. “The work we did was intense,” he says. “We visited the camps regularly, interviewing refugee families and documenting their claims in order to determine their eligibility for resettlement to the United States. We handled lots of cases of people who were fleeing horrific situations. After two years in the refugee camps, he accepted a position as project planning and evaluation officer with the Population and Community Development Association, based in Bangkok. During the next two years, he developed and coordinated implementation of projects integrating small-scale water systems and environmental sanitation in several provinces of northeast Thailand. When he returned to the United States in 1994, it was to accept a job as program officer for the AFL-CIO’s Asian-American Free Labor Institute and to complete a master’s degree at Johns Hopkins University’s School of Advanced International Studies. Accompanying him was his wife, Rachaneekorn “Roong” Poomipug, a Thai woman he’d met while she was working for another nongovernmental organization in the Lao border refugee camps. In many ways, Robertson concedes, it was good to be back in the United States and to reengage with people he’d known during his time in Washington, D.C. But he soon missed the exotic land, more than 8,500 miles away, that had become his new home. He arrived back in Bangkok in early 1998, amid the Asian financial crisis that was then tearing apart the economies and undermining employment in the region. As the Mainland Southeast Asia representative of the AFL-CIO, he was “at ground zero” working with local labor unions trying to save jobs, protect worker rights, and assist laid-off workers. Six years later, he moved to the United Nations to lead the U.N. Inter-Agency Project on Human Trafficking in the Greater Mekong Subregion and to help the six governments of the region reach a historic agreement to cooperate in combating human trafficking. He also traveled all over the region as a consultant, heading Asia Human Rights and Labour Advocates, a group he formed in 2006. Throughout the past 18 years, Robertson has been based in Thailand. In late 2009 he became the Asia deputy director for Human Rights Watch, a job he’s held ever since. While his energies are taxed by the vast area he oversees, covering Vietnam, Cambodia, Thailand, Laos, Burma, Malaysia, Singapore, North Korea, and Japan, he says it is work for which he has prepared his entire career. “I’ve always been fascinated by human rights advocates and migrant workers, the sort of people who will risk everything for the opportunity to better themselves and help others,” he says. “My work here routinely puts me in contact with people who take such risks, and I’m privileged to have their back in their struggles.